CPO promise to record all the Röntgen symphonies. Is there no end to their ambition? I hope not. Their intelligent engagement with using radio and regional orchestras throughout mainland Europe is paying dividends and will continue to do so for as long as they maintain this philosophy and business model. Röntgen wrote 4 symphonies in 1931 including No 18. As the notes point out this symphony, at rising 24 minutes, is long by comparison with the eight he wrote in 1930. It is the work of an unreconstructed Brahmsian. It has the character and sound-world of the Brahms Fourth and this includes its magnificent arching and singing strings and the romping brass triumph of its climaxes. There's no Straussian edge at all; just the sheer pleasure of a confident composer who can produce ideas that match the creative spirit. 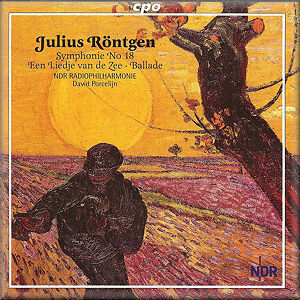 A long-time friend of Grieg, another strand of Röntgen's profuse creative engine is the folk inflection. The Ballade is dreamy and Grieg-like with a sweet Tchaikovskian curl to the style. We also encounter some grandiloquent Brahmsian, as at 3.16. Een Liedje van de see is another substantial folk-accented piece with Beethovenian explosions along the way. Superb juxtapositions of silky and sheeny strings and seductive harp seduction contrast with more dramatic propulsive writing. It’s always within the Brahms-Tchaikovsky-Grieg hegemony. The Six Old Dutch Dances are a sort of Netherlands Capriol. There is something of the antiquarian here and also of the baroque revivalist. It is not too precious being light on its toes. There’s nothing of Regerian stolidity about this though it must be said that Reger is not always stolid.